You are here: Home>Archive>Taylor Brown Collection.>Marriages.>Frank Brown and Beryl Taylor on their wedding day with family. 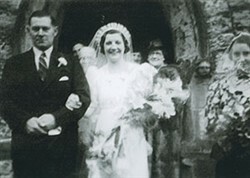 Frank Brown and Beryl Taylor on their wedding day with family. Photograph of Mr. and Mrs. Brown outside the church door with a group of people behind them. From left to right:- Mr. Frank Brown, Mr. Tom Taylor, Mrs. Beryl Brown, Mrs. Lou Taylor, Mrs. Blanche Florence May Brown, Miss Maisie Brown.